The latest in function and technology! Needle thread tension which matches sewing conditions given can be set on the operation panel and stored in memory. The needle thread tension adjustment needs experience. 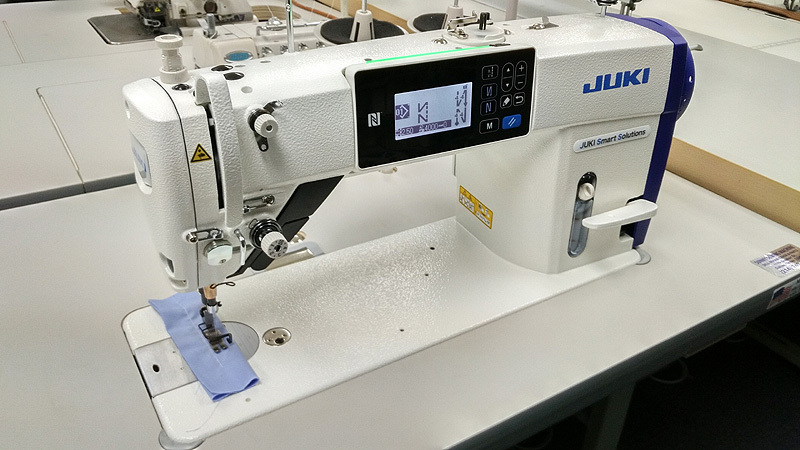 However, for this sewing machine, thread tension data stored in memory is reproducible, thereby reducing the setup time when the product to be sewn is changed.Exampl e : Needle-thread active tension demonstrates its effectiveness in the topstitching process. For welting shoulders of a difficult-to-sew material, uniform stitches can be produced continuously by appropriately changing the sewing conditions even if the right and left material fabric differ in texture grain. MOTOR & VOLTAGE: This machine is equiped with a Genuine JUKI motor operating on standard 110 Volts power. MACHINE BROCHURE: Click here for PDF brochure.